← Rule No. 9 of The Middle Ground. The Right Cut. Does there come a time in a man’s life when he is too old to wear shorts? Is this really a “work” look? Even for creatives? I just ask as I’ve seen a lot of suggestions lately that we take to tailored shorts. I confess to liking them. They remind me of the Bermudas that my parent’s generation wore to backyard cook-outs. Nothing baggy,cargo-y or loosely slung about the hips. But I wonder (outside of visiting the beach or a the pool) if shorts have an expiration date? Last year… less tailored, but a prep stand-by for garden parties. What do you think? Easy yes. But can shorts be elegant, to a point? 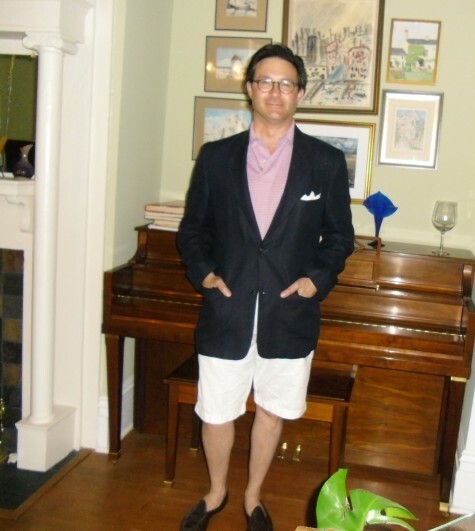 This entry was posted in Elegantology and tagged Banana republic, Casual summer dressing, shorts, The Rake. Bookmark the permalink. 9 Responses to Who Wears Shorts? Too old to wear shorts? Yes, somewhere after your 12th birthday. I never wear them outside the house. Backyard grilling is another story. Shorts elegant? No. Never. 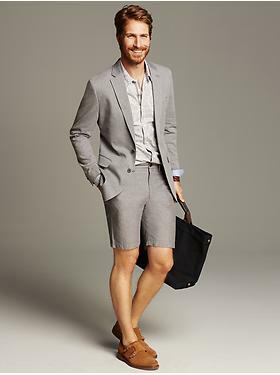 I think as soon as a man hits say 30, shorts should only be worn when practical – in his house/backyard, on the tennis court, at the beach, or at the gym. My father would wear Bermuda shorts, knee socks and loafers to summer (casual) dinners. It looked fabulous. Shorts exude youthful, unsophisticated athleticism, not elegance. There is definitely a place for that, but not with a blazer or sport coat. The two concepts clash with each other, creating an oddity. There is a certain balance that exists between the upper portion of the body and the legs when a blazer is worn, but shorts break up that balance and in so doing, destroys the natural harmony found in the male silhouette. For me, no shorts cannot be elegant to a point. Not wearing socks is already a downer and who has the legs or ankles for pulling this off? For me personally, shorts belong to leisure and with sandals with or without socks. And God forbid, not those over the calf dress socks pulled up high! There are nice cotton or linen slouch socks that will look a lot better. Enjoy June and any upcoming garden party. I am fairly sure that the last time I wore shorts for non-sport related reasons was August 17, 1964. I have always advocated for being situation appropriate. Plenty of factors can help determine what is appropriate, weather/temperature being one of said factors. Clothing should serve a function. In some situations that function is to project formality or seriousness, in others it is utility and protection (chaps). 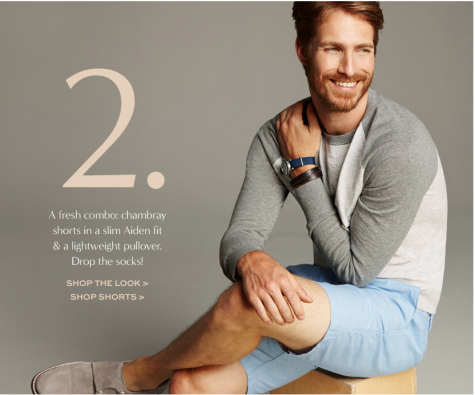 There are plenty of situations where shorts are called for, but most if not all of those situations are not elegant. Unless of course one is actually -IN- Bermuda. I prefer shorts, and I think they have a lot to contribute, especially on warm summer days.